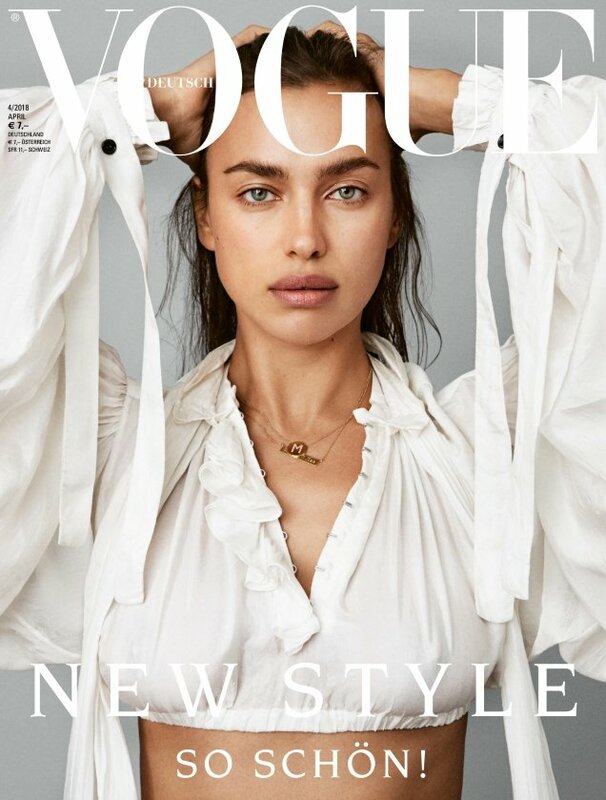 We’re pretty used to seeing Irina Shayk sporting the bombshell look, whether she’s giving good face on Vogue Japan, vamping it up on Vogue Russia or doing what she does best as the face of Blumarine. The Russian beauty tries on a new look for Vogue Germany’s April 2018 edition, ditching the heavy makeup and big hair, allowing her natural beauty to shine through. Wearing a white Louis Vuitton blouse, the cover (photographed by Daniel Jackson) marks Irina’s third appearance on the German fashion bible. Following a sleek and sophisticated Vogue Arabia cover appearance last month, the majority of our forum members were impressed. “Beautiful, she looks great both glammed up and barefaced. And especially – like an actual grown woman and not a teen. Lovely cover!” applauded russianelf. “I love it because I love her. I actually think she is very versatile and can pull off just about anything because she is extremely beautiful and looks fierce and effortless at once. She can do no wrong in my eyes,” voiced gazebo. “I think it’s a lovely cover,” TeeVanity echoed. In agreement over how wonderful the cover turned out was Nomar. “Oh Irina looks so beautiful. This is such a gorgeous cover,” he admired. “Irina is one of my favorites! IMO she can do no wrong! This isn’t her best look, but so what,” said Simera. Not everyone was so head over heels, however. “Natural beauty shots aren’t her forte, she looks haggard, Nymphaea said. “I prefer the full make-up look on Irina. These natural, soft things aren’t for her, she looks weary here. The concept is nice though,” reasoned forum member Srdjan. Are you a fan? See more from Irina’s cover shoot and join the conversation here.